We can all be heroes! That’s the inspiring message of the New York Times best-selling picture book biography series, “Ordinary People Change the World” from author Brad Meltzer and illustrator Christopher Eliopoulos. In honor of Helen Keller’s birthday on June 27, Blind Motherhood reviewed one of Meltzer’s books from the series, “I Am Helen Keller” to share on Vision Aware’s Blind Parenting Series. “I Am Helen Keller” begins with the book describing how Helen contracted a rare disease causing her to become deaf and blind. Both the narrative and the comic book like illustrations help children to understand the fear and isolation Helen and her family experienced as she attempted to communicate with the world around her. At six years old, Helen was introduced to Annie Sullivan. 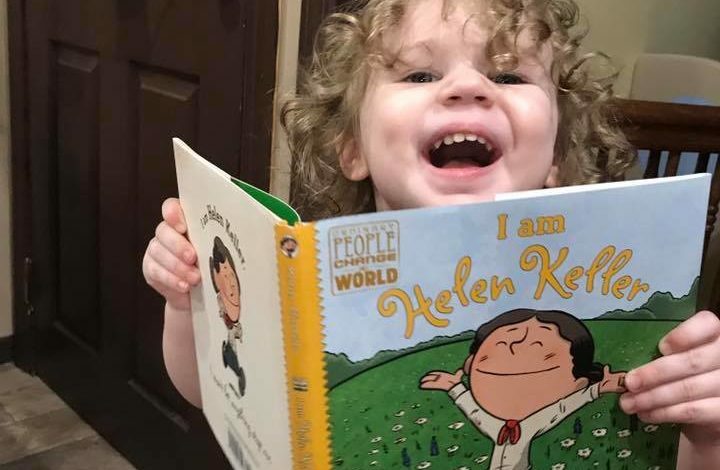 With Ms. Sullivan’s help, Helen learned to speak and read. The famous water pump scenario is depicted, showcasing Annie Sullivan’s implementation of sign language with Helen Keller. Meltzer’s book contains illustrations prompting children to try signing themselves, spelling out each individual letter in the word “water.” We learn through the story how Helen also incorporated braille into her education. A page containing the entire alphabet in raised braille is also provided. This delivers both a visual and tactile element that can be enjoyed by readers who are sighted and blind or visually impaired. “I Am Helen Keller” also discusses the impact of educator Sarah Fuller. Historically, Fuller’s role with Keller’s education has not been widely discussed, especially in children’s books relating to life. Taught by Alexander Graham Bell, Ms. Fuller was trained in the skill of teaching deaf children how to speak. Sarah was a passionate advocate of this practice as well as the promotion of education for children who are deaf starting at the earliest age possible. In 1890, Sarah Fuller applied the methods she learned and developed from Bell, giving her first speech lessons to none other than Helen Keller. “I Am Helen Keller” concludes by showing how Helen used her education to become one of the most successful social activists in history, advocating for people who are deaf-blind, poor, and women’s issues all across the globe. My children have many of the books in this series with “I Am Helen Keller” being their favorite. Ages four and two, they identify Helen with myself, both because of our disability and how I acquired my blindness through disease. One of the things I most love about this book is that it not only teaches children about who Helen Keller was, but it inspires young readers to consider solutions for the complex obstacles they may experience throughout their lives. Perhaps equally inspiring is the emphasis placed on Helen’s teachers, both Sullivan and Fuller. Without the help of these two remarkable educators, Keller would not have risen to the level of success she had with her advocacy work. “I Am Helen Keller” pays due respect to these innovators of education, reinforcing the respect children should have towards their teachers. Overall, the only negative aspect with “I Am Helen Keller” for parents who are blind or visually impaired are the illustrations. While they are child-friendly and intricate, the comic book bubbles used over the character’s heads are extremely small. I personally alternate between an OrCam and a handheld magnifier for reading text to my children. Neither option worked for reading this particular book. While you could skip the dialogue contained within these bubbles, you risk the chance of missing out on key parts relating to Helen’s story. My sighted husband had to assist me with reading the hardcover version of this book to our daughters. However, check with a low vision specialist as there are other low vision optical devices that might help a reader who is visually impaired. Despite this issue, “I Am Helen Keller” is the perfect addition for your home, classroom, and public library. It’s also the perfect reference for elementary school history projects and biographies. The book is available in paperback and hardcover additions for the Kindle.